A 1946 NAACP button given to a nurse at a hospital by an African American male in his 40's, who received treatment because of the riot in Chicago of 1966. The button was a token of appreciation to the nurse who was placed on "Red Alert" due to the nature of the riot. 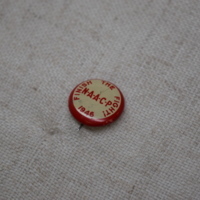 Civil Rights Memorabilia , “1946 NAACP Button,” UIS History Harvest, accessed April 25, 2019, http://uishistharv1.uis.edu/items/show/317.